This time last year, Andrew Clark was picking up trash. The Yankees are hoping he’s their hidden treasure. A 13th-round draft pick of the Texas Rangers just three years ago, the 25-year-old first baseman found himself out of baseball completely just last year. But, a career .308 hitter, the move was by choice. Clark earned his degree from Louisville in Exercise Science, but found it was of little use to him when it came to finding a job in the “real world.” So he took the first job he could find near his Bowling Green home: Garbage man. He started the year in the independent Frontier League and put up video game numbers right away, batting an absurd .421 with seven home runs and 24 RBI in 24 games. Those kind of numbers will get you noticed anywhere, and the Yankees were among several teams to come calling on the 6-foot-2, 220 pounder. “I looked at the numbers briefly, I did,” said Thunder manager Tony Franklin. Clark would have been on a different side had things worked out differently. The Rangers agreed to bring him back, but let him go after he failed to pass a physical. The White Sox signed him approximately a month ago, but also released him without playing a game in their system due to a bone spur in his shoulder that will require surgery. “I was set on being in Evansville for the remainder of the season,” Clark said. Clark’s wife, Brittany, has been a lifelong Yankees fan, so that made the blow of leaving his days of being back at home with her easier to take. Semi-retirement, which also entailed working as an unloader at UPS and at a Nissan dealership, just wasn’t for him. It wasn’t so much Clark’s signing by the Yankees that was curious at the time, it was his assignment. 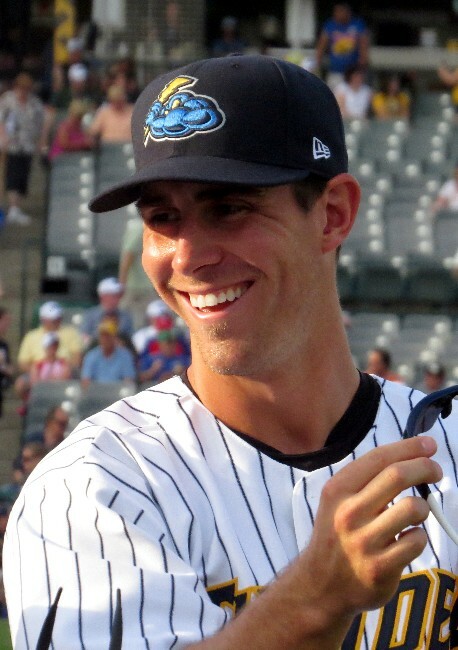 During his brief career in affiliated ball, he’d never advanced past High-A, but was assigned directly to Double-A Trenton upon agreeing to terms with New York. No sweat. In his first five games, he’s hit .429, and he stroked his first two Double-A home runs last night in Trenton’s shutout win over Erie. “To be honest with you, there’s not much difference in the pitching from where I was coming from in Indy ball,” he said. But Clark has fit right in with his hew teammates, and could start to make some noise in the organization if he continues his torrid pace. This entry was posted on June 26, 2013 at 3:50 pm and is filed under Uncategorized. You can follow any responses to this entry through the RSS 2.0 feed. You can leave a response, or trackback from your own site. Thanks for the info. Mike. It is an interesting story and hopefully it works out well for all. same ideas you discuss and would really like to have you share some stories/information. I know my readers would appreciate your work. regarding this article, in my view its really awesome designed for me.